On March 19 2018 whilst Sudan, the last Northern White Rhino in the world, closed his eyes for the last time, leaving behind only two critically endangered females, his daughter and granddaughter, we woke up to the reality of how close the extinction of rhinos really is. A truly shocking fact is that in 1960, there were approximately 2000 Northern White Rhinos roaming the grasslands of East and Central Africa. How did we get to this point where there are only TWO left? However it is not just the Northern White Rhinos that are impacted, although they are the most critically impacted. There are five species of rhino that survive today – Black, White, Greater One-Horned, Javan and Sumatran as well as sub-species within these groups. The Asian rhinos, Javan and Sumatran rhino, are considered to be critically endangered. The Greater One-Horned rhino, found in India, has increased in numbers up to 3,550 from only 200 in 1900. The third Asian species is listed as ‘vulnerable’. The remaining two species are found in Africa and are the Black rhino, which is ‘critically endangered’ with only around 5,000 remaining, and the White rhinos, which are classified as ‘near threatened’. The subspecies, which are the Western Black rhino and Northern White rhinos, are now officially extinct in the wild. 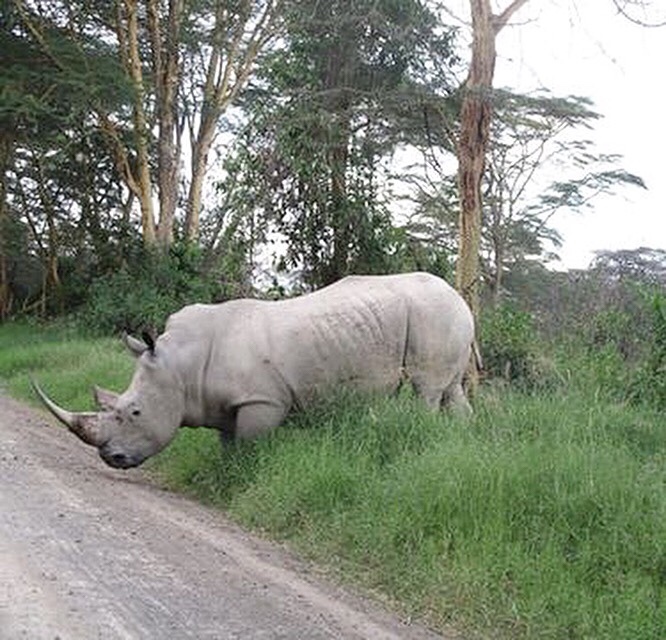 The only two remaining Northern White rhinos live at Ol Pejeta Conservancy in Kenya. The two main contributing factors to this major decline in rhinos have been a major poaching crisis as well as habitat loss. The Rhino horn is in high demand and one of its uses is in traditional Asian medicine and folk remedies, where it is usually ground up and used for a range of ailments. Trophy hunting is another factor which has been hugely contributing to the decline of this endangered species as it is an animal that is highly desired due to its rarity. It sickens me that people pay hundreds of thousands of dollars to have the right to kill an endangered species like this, limiting the chance of our future generations of seeing these wonderful animals as we are able to today. “It may be too late for the northern white rhinos, but we still have time to save all the other species,” says Ms. Dean from Save the Rhino International. So many amazing organisations have been highlighting the extent of the rhino crisis, and more recently I have loved Tusk’s initiative of the Rhino Trail in London which highlights the ongoing threat from poaching to the survival of rhinos in Africa through unique works of art that have been on on display at iconic London sites until World Rhino Day and will now be auctioned by Christie’s, on 9th October 2018. Helping Rhinos is another fantastic organisation that has several ways for you to d0nate or fundraise towards conservation and education initiatives that will ensure the long-term survival of the rhino as well as other endangered wildlife in their natural habitat. 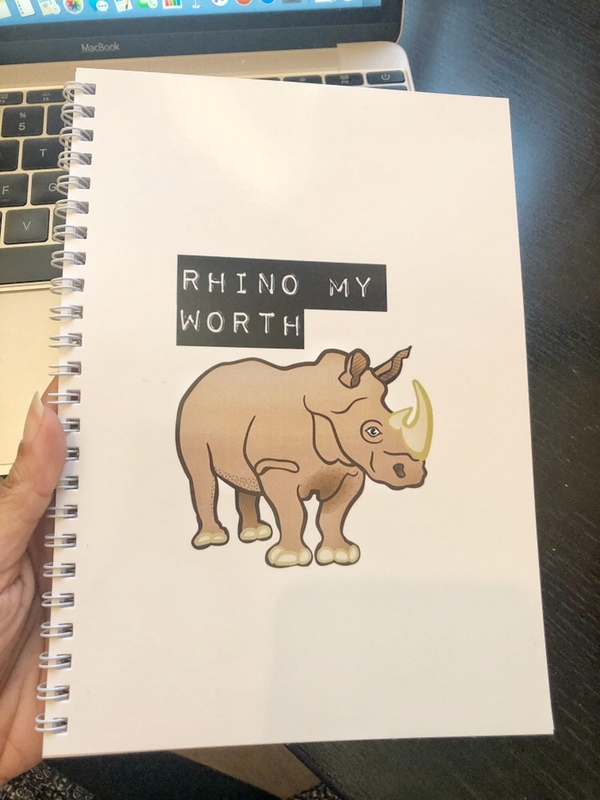 I have also created 5 limited edition A5 Soft Back Cover lined notebooks with my own design that says “Rhino my worth” which I am selling for £10 each and the full proceeds will go towards Helping Rhinos. If you are interested in purchasing one please send me an email. I hope that more can be done to save these amazing animals so that they remain on our planet for years to come. It is disgraceful that as a race we have done this to these beautiful creatures. Thank you for highlighting the extinction issue and all your work in supporting these organisations who work tirelessly to save Rhinos. I think your beautiful notebook is a fab idea. There are no words to describe the extinction of animals in this generation. It shouldn’t be happening and raising awareness and education is our only hope. I’ll be buying one the notebooks! What an incredible cause to support. I love your notebook. Such an important cause, so sad to see what the human race have done to these beautiful animals.